Part of why I think Mets fans love the Mets with such fervor is because they've never been Hollywood. Even in '86, they were characters, but never intangible comic book heroes. The Mets have always been the team that even though you know they don't, you can sorta imagine that after a home game they all walk home with their Kahn's gym bags to their humble Corona row houses on Roosevelt Avenue. 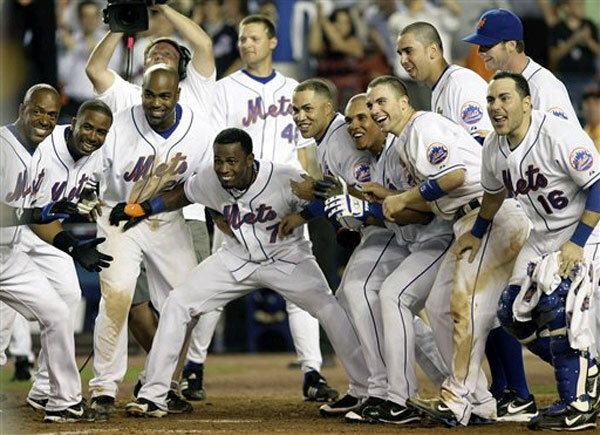 I mean, look how excited they are in this picture, welcoming Shawn Green, who hit a walk-off 11th inning home run, to the plate. Only the 1st place Mets get this genuinely excited about a win versus the 3rd place Cardinals at the end of June.